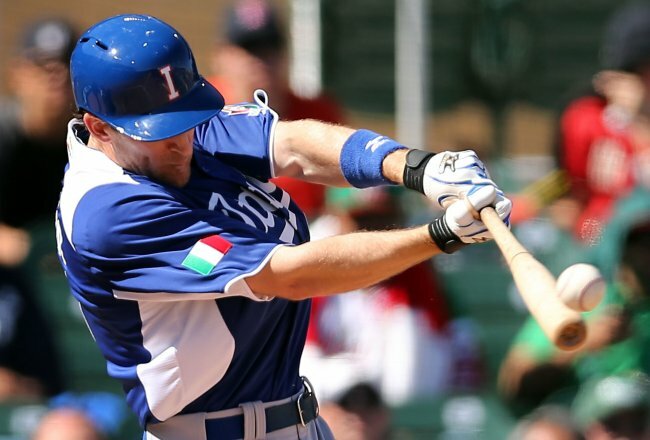 Italy’s Nick Pugliese made four appearances during the 2013 World Baseball Classic, yielding two hits and one run while striking out two in two innings of relief. 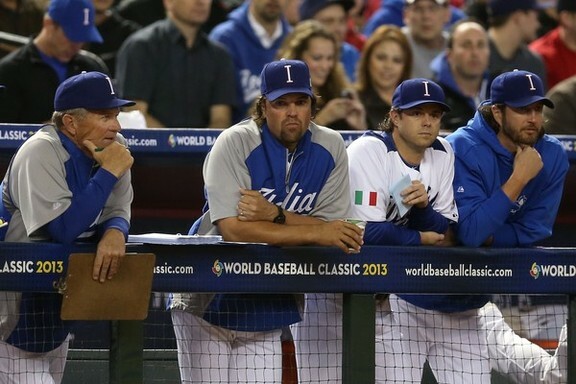 With Italy trailing by one run in the 2013 World Baseball Classic opener at Salt River Fields at Talking Stick, Mexico’s Adrian Gonzalez singled in the bottom of the seventh inning. 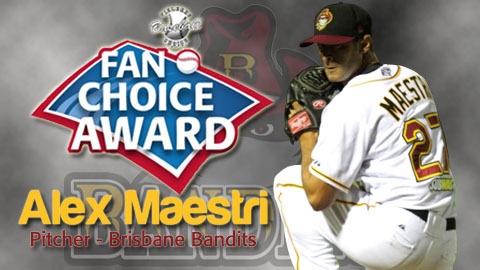 Manager Marco Mazzieri needed Italian American Nick Pugliese to get his team out of a jam to end the inning and keep Italy in the game. The Florida native got Mexico’s Jorge Cantu to ground out and end the scoring threat. 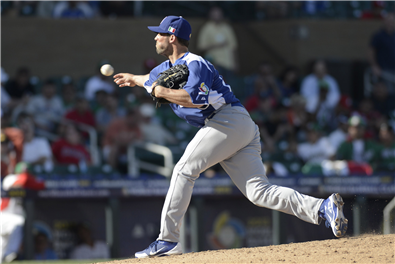 The former Angel minor leaguer held Mexico scoreless in the eighth to set the table for closer Jason Grilli, who saved Pugliese’s first WBC win after Italy scored twice on Sergio Romo. 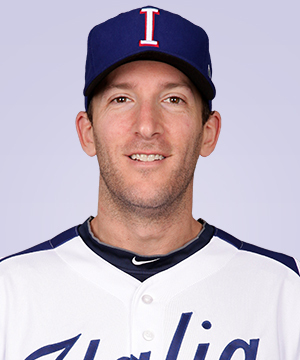 Italian American Nicholas Pugliese served as the setup man for 2013 National League All-Star closer Jason Grilli closer during the World Baseball Classic. Euro Cup and Europe’s first-ever representative in the Asia Series, Pugliese takes on the champions from the pro leagues in Japan, Chinese Taipei, Korea and Australia. Pictured here winning the 2012 European Cup, Unipol Bologna has won back-to-back Euro Cups. 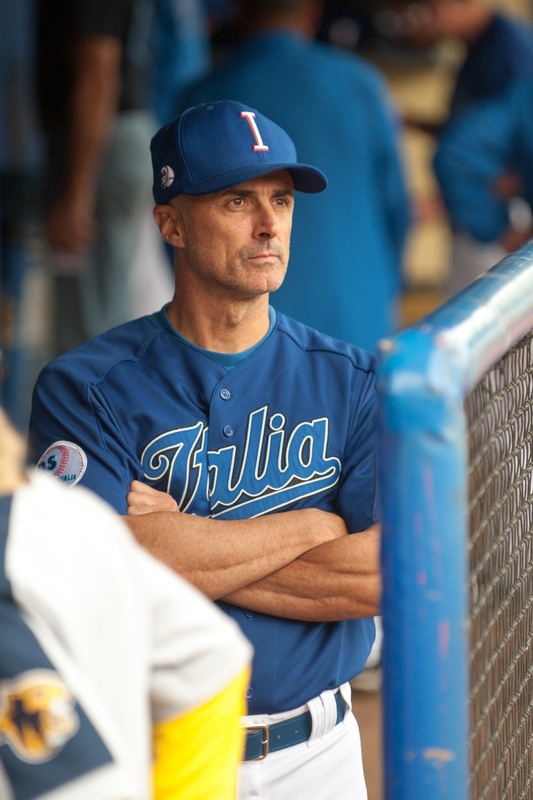 Both Unipol Bologna manager Marco Nanni and Team Italia manager Marco Mazzieri are truly committed to expanding the game’s reach in Italy so that the defending European Champions can become baseball’s next international superpower. We spoke with Bologna’s closer prior to the start of the Asia Series in Taiwan (which runs from November 15-20). 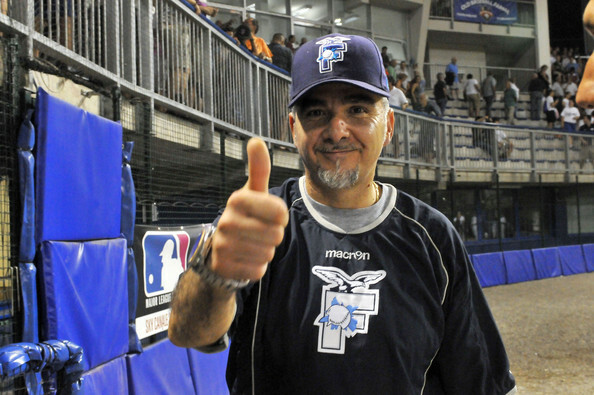 Roberto: Having experienced MLB-affiliated ball with the Angels organization, you were a welcome addition to the Italian baseball fraternity. 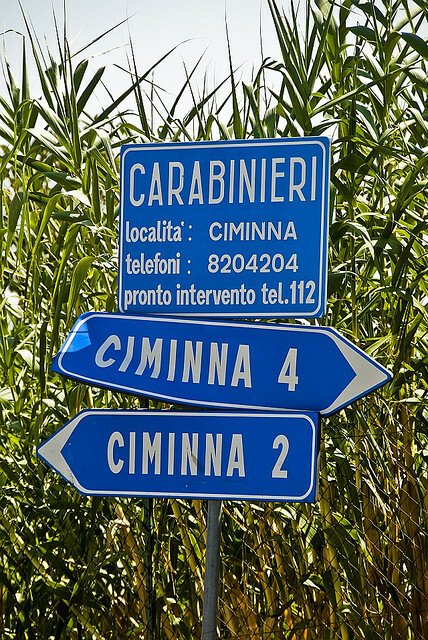 Explain the transition from Fortitudo Bologna to Team Italia. Nicholas Pugliese: When I got the call to go to Bologna to play, I shot right over. I didn’t waste any time. I saw it as an experience to travel and to play on an international level. It’s kind of given me a second life in terms. 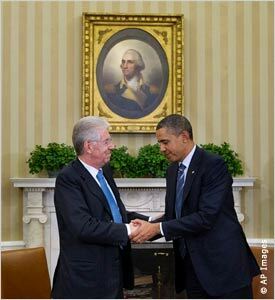 Because I would never be in this position if I wasn’t involved with Italy to begin with. Team Italia manager Marco Mazzieri would have never seen me so I have nothing but good things to say to my GM that found me, Christian Mura, and Marco Mazzieri for giving me a shot to play on this team. 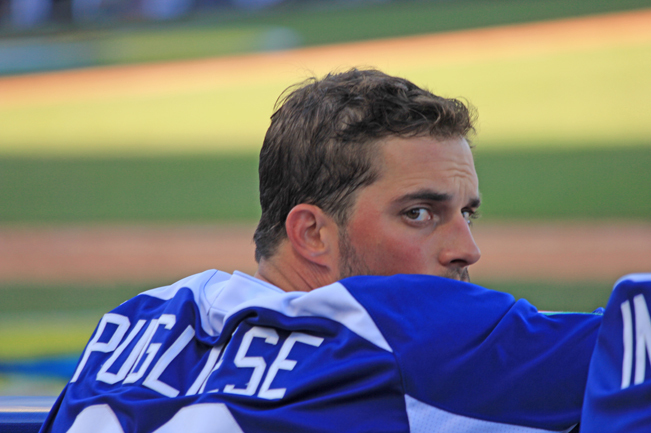 LA Angels’ Tom Kotchman signed Pugliese in 2008. 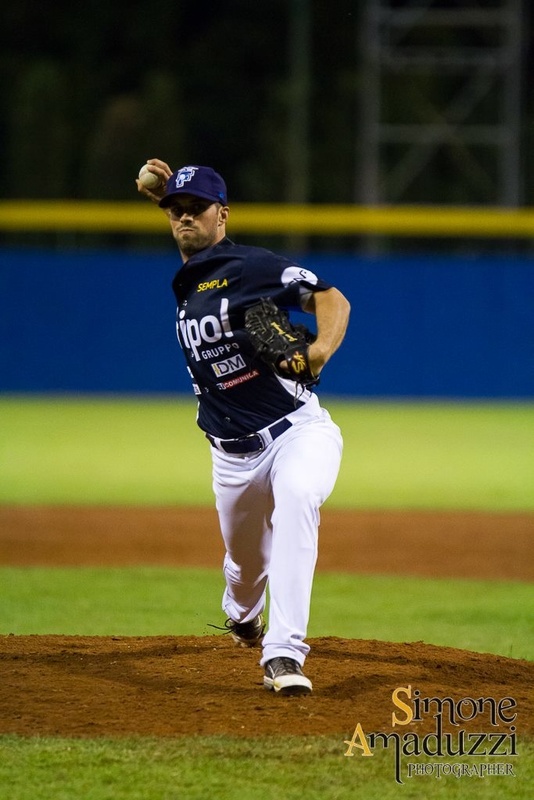 Roberto: After pitching at Lake Sumter College, you transferred to Steton University and made the 2008 All-Conference team after issuing only 11 walks in over 65 innings. 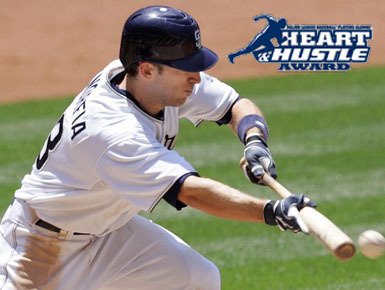 Although you were not drafted, you still managed to be signed by the Los Angeles Angels. Nicholas Pugliese: It was awesome. 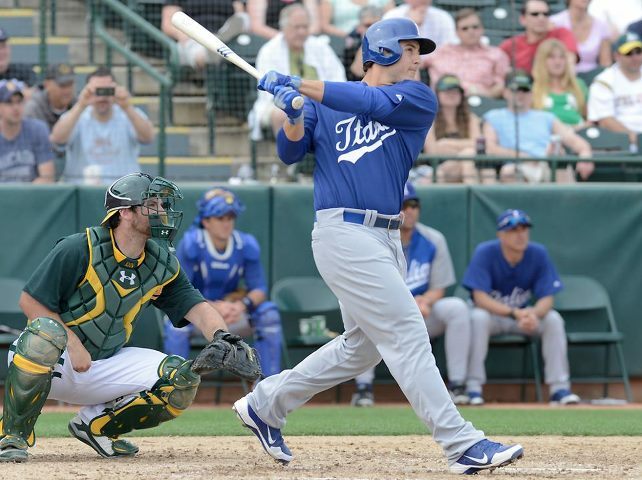 Tom Kotchman of the Angels gave the opportunity to play some professional baseball. I am forever grateful for that. I loved the three years I played for them. It was a great organization. I learned a lot, and I give a lot of credit to them for where I am right now actually. 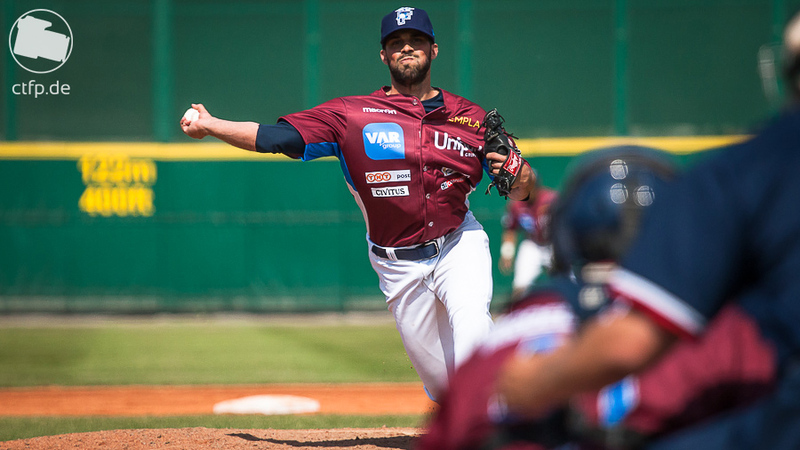 Since joining Unipol Bologna in 2011, Nicholas Pugliese has consistently been one of the most dominant relief pitchers in the Italian Baseball League. Roberto: Having played at Tempe Diablo Stadium during Angels Spring Training and later return to play against your former organization as a member of Team Italia must have been a homecoming. Nicholas Pugliese: It was a homecoming because I hadn’t seen these guys in a couple years. You’re talking about 300 guys! We all got close, we worked together, we played together. The whole coaching staff I got to see when we played the Angels. It was an awesome feeling. To see their faces light up when they saw me. Not expecting to ever see me out here again. It was a great experience. Roberto: Through the blessing of Italian baseball, you have received a new lease on life. Out of all the minor leaguers that you played with in the Angels organization, how many of them can say they have pitched against MLB All-Stars at Chase Field and Marlins Park in the World Baseball Classic? Nicholas Pugliese: Not a whole lot. They actually all called me and told me how jealous they were. It’s kind of bittersweet how things turned out, but I wouldn’t trade in this experience for anything. It was unbelievable. Roberto: Getting the win against Mexico must have been one of your most memorable moments in baseball. Nicholas Pugliese: The whole tournament was the highlight of my whole baseball career obviously. It was short, but it was amazing. The competition we were able to see, the guys we were able to meet. We proved that we can play with anyone. 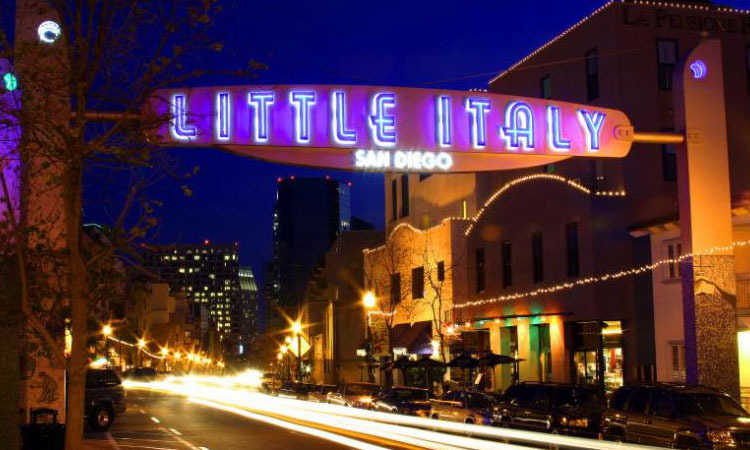 Roberto: Let’s talk Italian heritage. Nicholas Pugliese: I’m sort of split between an Italian father and a German mother. My dad’s side is the strong Italian side. It’s always been about family and cooking. It actually goes back all the way to my great grandparents, who were born in Italy. So the actual paperwork wasn’t easy to find to go back and get all that stuff going. My Italian heritage will always be there, and I’m proud to play on this team. Roberto: Did your mindset and pitching philosophy change when you crossed the Atlantic? Nicholas Pugliese: It changed a little bit. 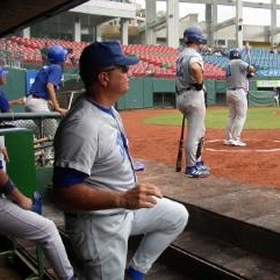 International baseball…the whole set, the rules, the hitters…everything changes a little bit. So you adapt. You either adapt fast or die pretty much. But you’re constantly adapting. That’s what baseball is all about anyways. Coming back to the World Baseball Classic, we had to constantly change to these hitters from country to country, team to team.. I mean you learn to adapt fast or none of us would be here in the first place. Roberto: What was the initial reaction by the Italian-born players to have an Italian American like you join their team? Nicholas Pugliese: Playing on Team Italia is a little different because I have been playing for the Italians for two years in row now. I’ve gotten to know a lot of these guys since we’ve been playing together for a while. Initially coming to this team was a little standoffish. You know, these American guys coming in. And it would be the same way the other way around. But as long as you are there to win, and you’re giving your all then they take you in. That’s how it should be. Roberto: Playing for the Italian National team, you have assumed the role of closer when Italia won the 2012 European Championship. team for practices in preparation for the World Baseball Classic? Nicholas Pugliese: It was a totally different energy when they showed up. We were practicing for about a week without them. We were working hard and everything. But as soon as they could all come, it was just a total new energy. We’ve meshed obviously and you could see how we play the game. We’ve meshed very well. A quick mesh..which is important. That’s why a lot of these teams got upset because they hadn’t played together, and they were kind of playing selfish. I mean instantly we played well together…we meshed. You can see the result from that. What it really comes down to is baseball is universal. 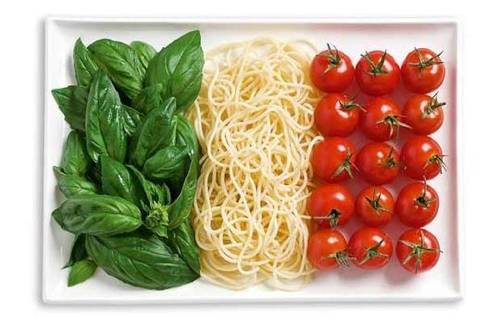 Whether you were born in Italy or you were born here, you speak Italian or not, it’s universal. You have a passion for the game. I mean you are going to give it your all. Everyone sees that. It’s easy to come together and win some games. Roberto: Easier said than done. Look at Team USA in the WBC. Team Italia literally gifted them a win so that they could qualify for the second round in Miami. Nicholas Pugliese: We had a chance to take them. We had them shaking in their shoes a little bit. It was just one bad swing. We did take it a little different. It wasn’t a must-win for us. We kind of used it as an opportunity to get all our guys in, get the experience going. If it really came down to it into a must-win situation, the outcome might have been a little different. But I mean for what it was worth, we played them tough and they were playing really tight for a while. Roberto: Having already qualified for the second round prior to game time against Team USA, you have got to admit Team Italia was playing for fun. Nicholas Pugliese: We definitely had a big weight lift our shoulders. We had a lighter energy going in there, but at the same time when it comes down to it we’re going to grind it out. It was good. We had a good time. Nicholas Pugliese: I picked Grilli’s brain a lot. He’s probably sick of me by now. But every chance I had to go up to him and ask some questions, I’m just all ears. I’m a sponge with him. I love talking to him. He’s got a lot of awesome knowledge. He’s a great guy to be around. All the pitchers really look up to him. 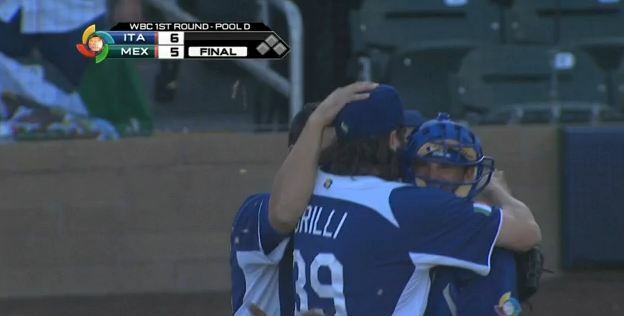 I mean I don’t have the stuff that someone like Grilli has out there. I don’t have the 96 mile per hour fastball so I have to just go with straight aggression and go after these guy–not wasting any time and pitching to contact. That’s my game plan, and that’s what I’m going to go out with there every single time. I’m just hoping that I can help the team keep moving on. Roberto: While interviewing Mike Scioscia, I asked if he would consider joining the Team Italia coaching staff, and he said that would be dependent on how the Italians played. Nicholas Pugliese: I don’t know how many more stars we can add to this coaching staff, but adding him would be amazing. I don’t know what else he wanted to see from us at this tournament. All he had to do was turn on the TV and enjoy his Italian heritage. 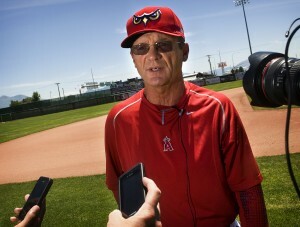 It would be awesome to see Scioscia on the staff at any time. 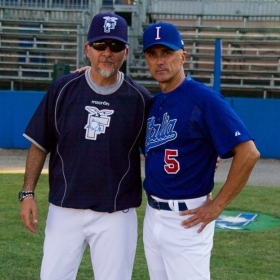 Roberto: I feel that Team Italia is blessed to have such a talented coaching staff featuring Bill Holmberg, Mike Piazza and Frank Catalanotto to take Italian baseball to the next level so that the team can compete with the game’s elite in MLB. Nicholas Pugliese: Pitching coach Bill Holmberg has always been great. Mike Piazza has been awesome. He is just one of those special guys. He and Frank Catalanotto, you see them on TV and you look up to them. The next thing you know you’re in the dugout making jokes with them like everyone else. It’s awesome that they can relate to us on that type of level and share their knowledge with us. 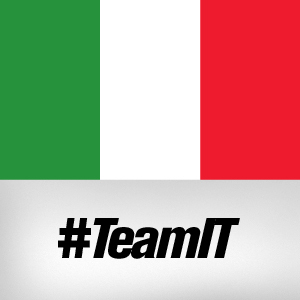 Roberto: Team Italia is a very special team. In fact, two of your Italian teammates–Juan Carlos Infante and Alessandro Vaglio–will be joining you on Unipol Bologna in the Asia Series. 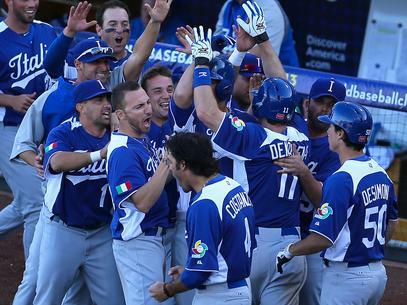 What are your chances of doing what Team Italia did in the 2013 World Baseball Classic? Nicholas Pugliese: I know all the Asian teams will be coming off of their seasons and will not only be baseball ready but highly talented. So it would be nice to head out there and surprise some guys with a few sneaky wins. Roberto: Best of luck to you, the team and manager Marco Nanni. Thank you for your time! Nicholas Pugliese: Thank you Roberto! Unipol Fortitudo Bologna manager Marco Nanni likes his team’s chances in the Asia Series. 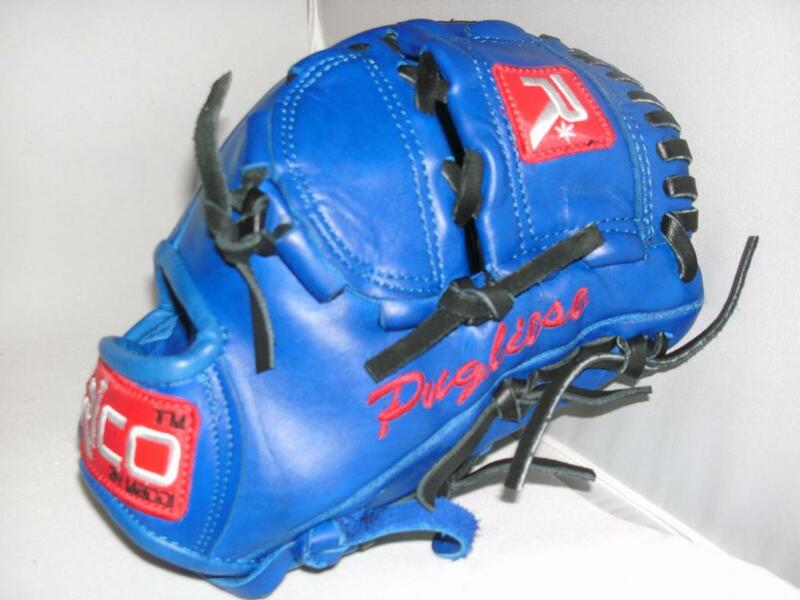 Nick Pugliese is ready to turn heads in Taiwan. Uni-President 7-Eleven Lions of Tainan welcome visitor Unipol Fortitudo Bologna on November 16. The European Cup Champions will get a well-deserved day of rest on November 17 before continuing on in the tournament should they qualify for the semi-final and final rounds of action with competition ending November 20. Italian supporters will have the opportunity to listen to Radio Arena Sportiva live broadcasts of the 2013 Asia Series with host Daniele Mattioli by clicking HERE. Anthony Rizzo lifts a jubilant Alex Liddi with Alessandro Vaglio nearby after Italy upset Mexico in the World Baseball Classic at Salt River Fields in Arizona on March 7th. and quite possibly Rome as members of the Baseball Hall of Fame in both America and Italy. 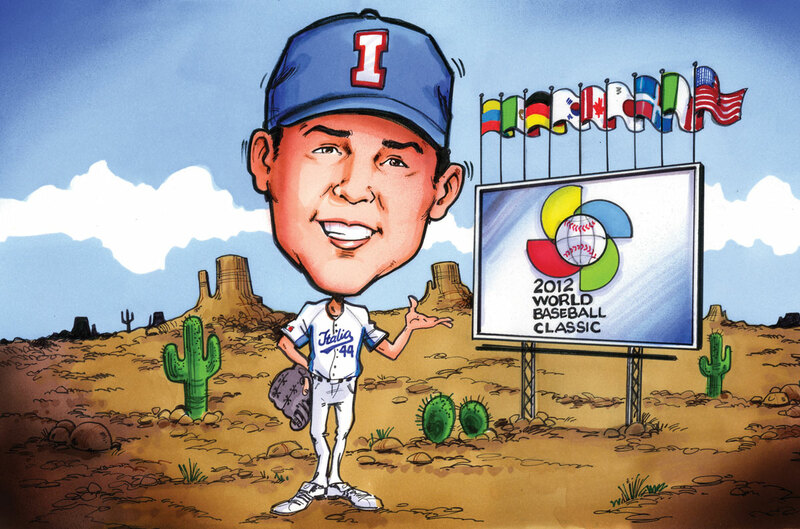 2013 WBC Team Italy slugger Anthony Rizzo raised $90,000 during his family foundation’s annual “Walk Off For Cancer” event in 2012.
the Anthony Rizzo Family Foundation. We’re proud supporters of the Anthony Rizzo Family Foundation. Check out Anthony’s story and foundation here bit.ly/ScGxre. 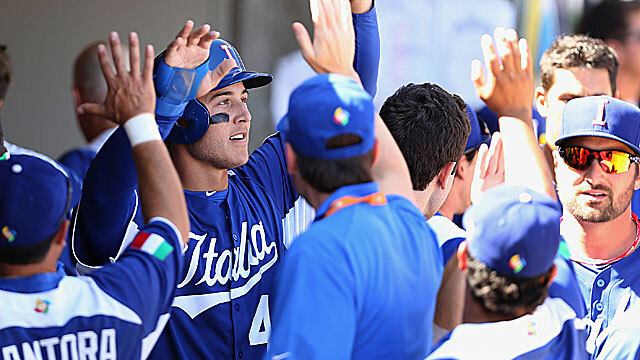 Anthony Rizzo gives the Team Italia trademark “Baci” to his Italian teammates in the dugout. 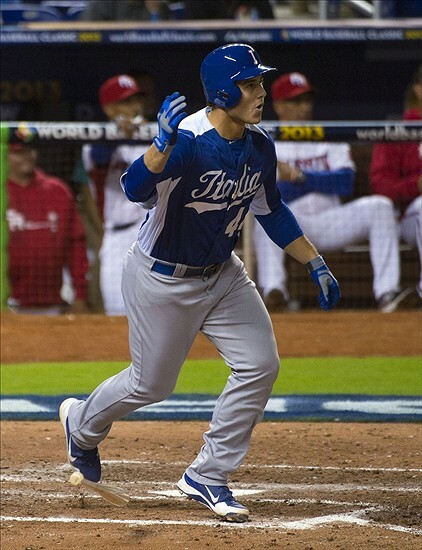 Anthony Rizzo drives a double into the right center field gap to clear the bases and give Italy a 3-0 lead in the fifth inning against 2013 WBC runner-up Puerto Rico. 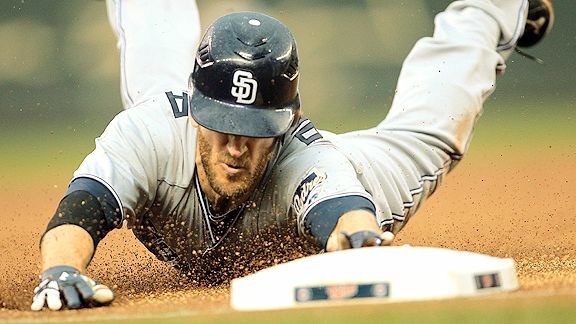 and successfully breaks up a double play attempt. Anthony Rizzo anxiously awaits what may be very well his finest at-bat in his career when he was down 0-2 against closer Sergio Romo and delivered a two-run double. 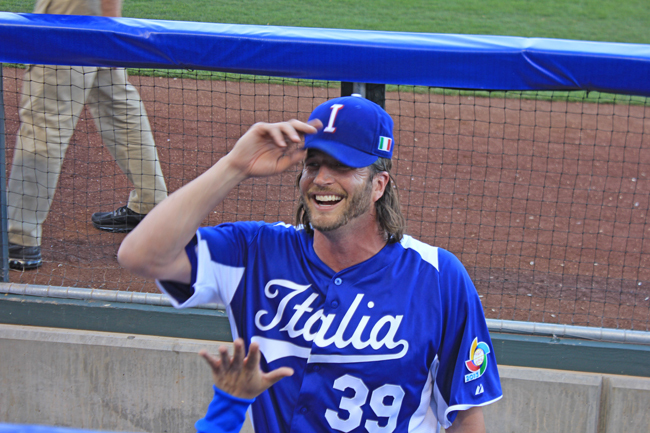 Italia at Phoenix Municipal Stadium on March 5th. 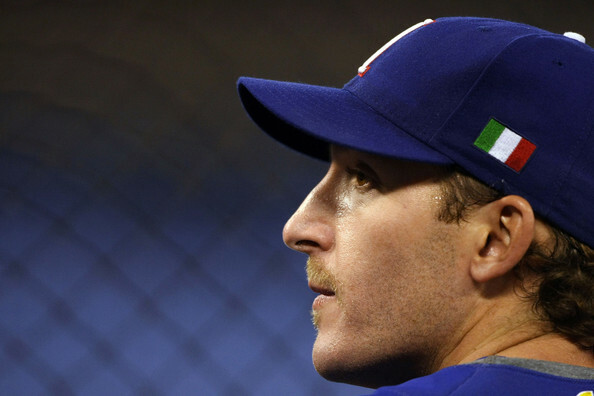 Rizzo conceded that he didn’t have the greatest of expectations for Team Italy, nor did he have any idea that his experience playing for Italia would be the most cherished of his career. “To be honest, I got over here, played the first couple exhibition games and thought, ‘We have good hitters, decent lineup, guys who do their job,’ and Mexico was the game of my life that I’ve ever played. It was so much fun and energetic. 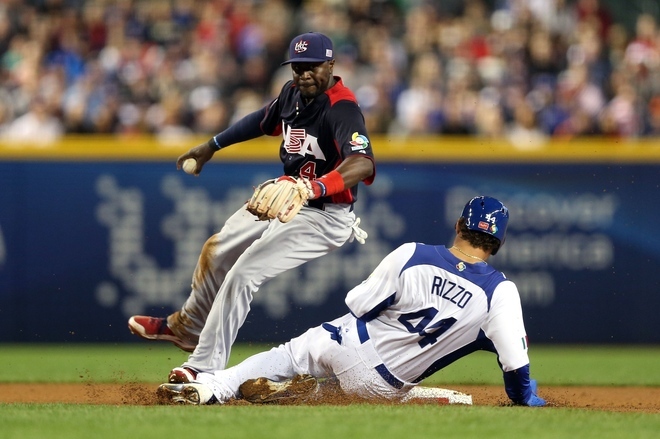 It was crazy.” The drama began in the ninth inning when Rizzo hit a two-run double off Mexico’s closer Sergio Romo to give Italy a 6-5 lead and ended when Italy’s closer Jason Grilli got Jorge Cantu to ground out to second with bases loaded. 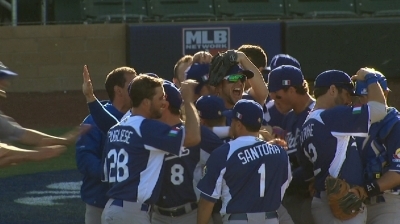 Anthony Rizzo is congratulated after his two-run double led to Italy’s 6-5 win over Mexico. Anthony Rizzo was all smiles when Italy was victorious since many Cubs players, coaches and staffers each pledged $500 to the Anthony Rizzo Family Foundation if Team Italy won. Not only was Team Italy victorious on more than one occasion with their come-from-behind 6-5 thriller over Mexico and their Mercy rule 14-4 clobbering of Canada, but the Anthony Rizzo Family Foundation were also big winners. Many of the Cubs personnel pledged $500 each to the nonprofit if Italy won at least one game. Chicago manager Dale Sveum joked with Rizzo saying that it was only $50, but the team has the morning meeting and friendly wager on video. All winning proceeds collected by the young Cubbie went to the Anthony Rizzo Family Foundation. “I made sure to text everyone with dollar signs to get their checkbooks ready,” Rizzo said. Once again Rizzo had beat the odds, but this time it benefited his charitable organization and the many families of cancer patients it serves. There was greater good than a game of baseball here. 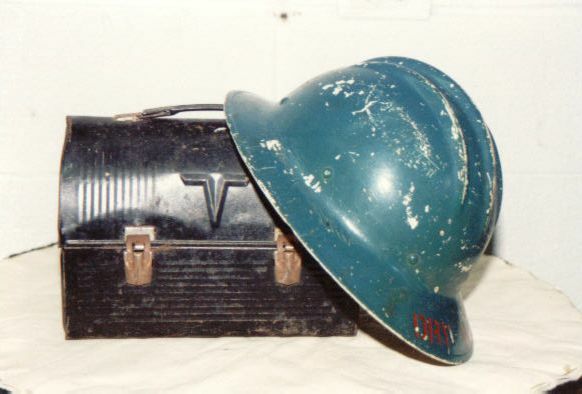 The lives affected by the good fortune of Rizzo and Team Italy far exceeded the box scores. The Anthony Rizzo Family Foundation’s race for a cure to combat this deadly disease coupled with the genetic makeup and clubhouse chemistry among Italian players and coaches made for a winning combination second to none as Team Italy moved on to round two of WBC play along with Team USA at Marlins Park in Miami. 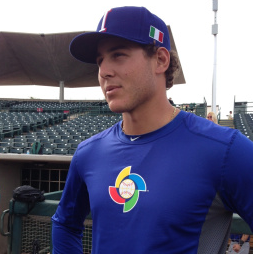 Anthony Rizzo prior to the first pitch of WBC play. 5-4 loss. Facing elimination versus WBC runner-up Puerto Rico, the left-handed slugger drove a three-run double into the right center field gap to put the Italians up 3-0 in the fifth inning, but Puerto Rico came back to lead 4-3. Rizzo walked in the top of the ninth to represent the game-tying run, but he would be left stranded. Vito Rizzo traveled from Ciminna, Sicily to Ellis Island, NY in 1905.
the Prince Albert and went through Ellis Island. 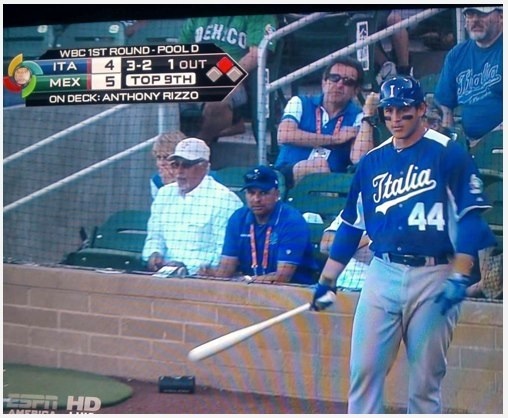 Rizzo’s father, John, remained in contact with his brother’s brother-in-law in Sicily throughout the WBC tourney. John Rizzo said, “They have a small core of baseball fans. 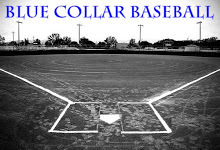 It’s like a cult thing.” It won’t be a cult for long as baseball continues to be gain popularity among Italy’s youth. 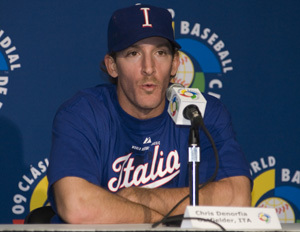 Having won back-to-back European Baseball Championships, the Italian national team has attracted the country’s finest athletes. Analogous to Chinese hero Yao Ming and Jeremy Lin’s contributions to the growth of basketball in China, Italian-born Alex Liddi and Anthony Rizzo are now baseball icons in Europe. With every Team Italy win came its fanaticism. It was no coincidence that the merchandise booths at Phoenix’s Chase Field had sold out of of t-shirts and jerseys before Italy’s game against Team USA. The onslaught of Italian youth sporting RIZZO proudly on their back has only begun. 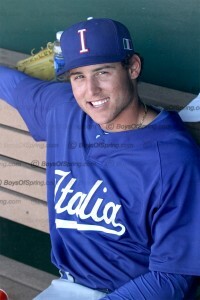 Just as he has become of the face of the Chicago Cubs franchise, Anthony Rizzo has become the backbone of the Italian baseball revolution supported by Mike Piazza. 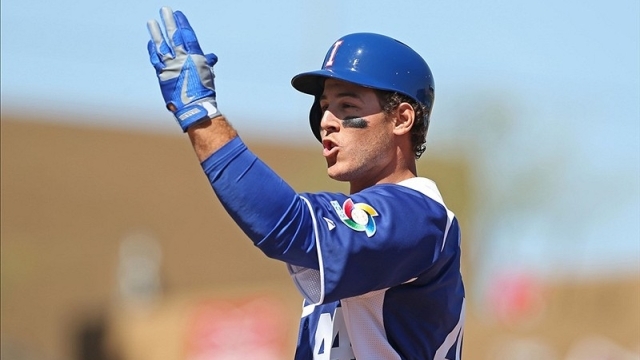 When the 12-time MLB All-Star catcher becomes the first Italian American to be inducted into both the American and Italian Baseball Hall of Fame, the stakes for Anthony Rizzo to repeat history will set the tone for a Team Italia reunion. 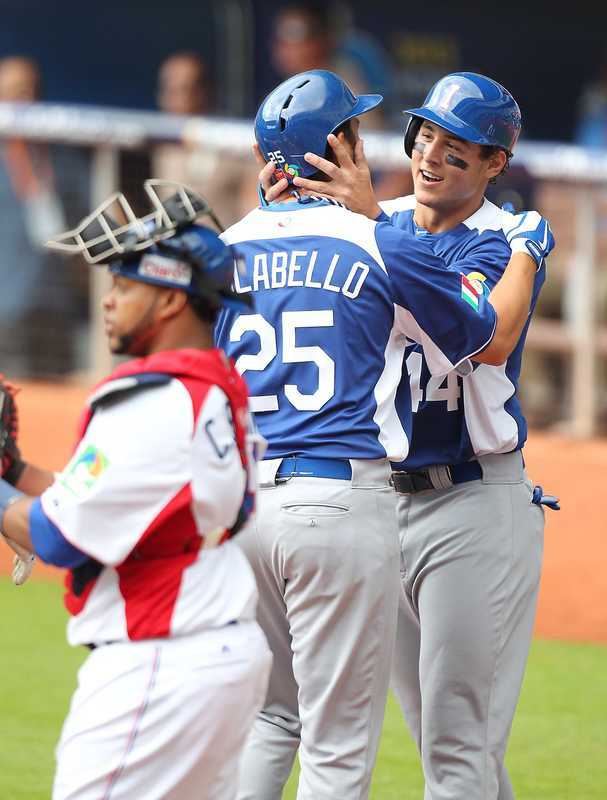 Anthony Rizzo congratulates Team Italy’s Chris Colabello after hitting a three-run home run in the first inning against 2013 WBC Champion Dominican Republic at Marlins Park on March 12th.